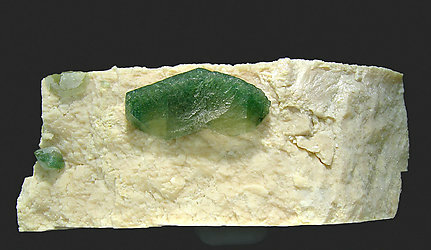 This Apatite has finally been correctly identified as the species Hydroxylapatite, very less common than Fluorapatite. Crystals, on a matrix of Orthoclase, are flat hexagonal dipyramids with no prism faces, a habit that is not often seen with Apatite. This specimen's photo has been reviewed and published in the magazine ‘Mineralogical Record’ on page 287 in the volume 40, number 4. This Apatite has finally been correctly identified as the species Hydroxylapatite, very less common than Fluorapatite. Crystals, on a matrix of Orthoclase, are flat hexagonal dipyramids with almost no prism faces, a habit that is not often seen with Apatite. Faces of a short prism can be seen on this crystal, a rarity with this material. The Hydroxylapatite is also attractively color zoned. This specimen's photo has been reviewed and published in the magazine ‘Mineralogical Record’ on page 286 in the volume 40, number 4. The specimen is very esthetic. 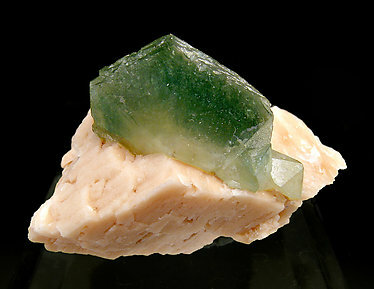 It has a unique crystal of a considerable size implanted on the Orthoclase matrix. 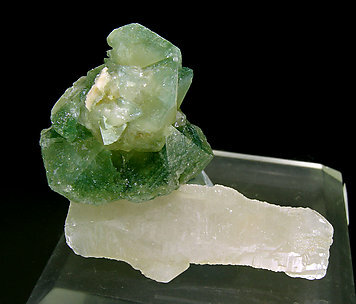 The crystal, dipyramidal, has deep green color, especially intense and very much uniform as usual on this material. 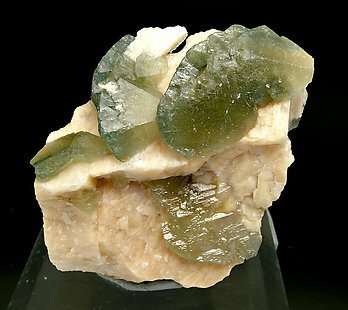 Very aerial group of dipyramidal crystals of very well defined faces and edges, of deep green color, on a matrix of Quartz.